The date of this task is earlier in the month than normal to avoid clashing with Remembrance Sunday. As this event has been arranged in advance, it may still be subject to change. Contact Julia at j.meldrum@gov.je or Jon at jonparkes@nationaltrust.je or phone Julia on 441600 or Jon on 483193 to check everything is still ok nearer the day. NOTE Please meet at 10.15am for a 10.30am start. 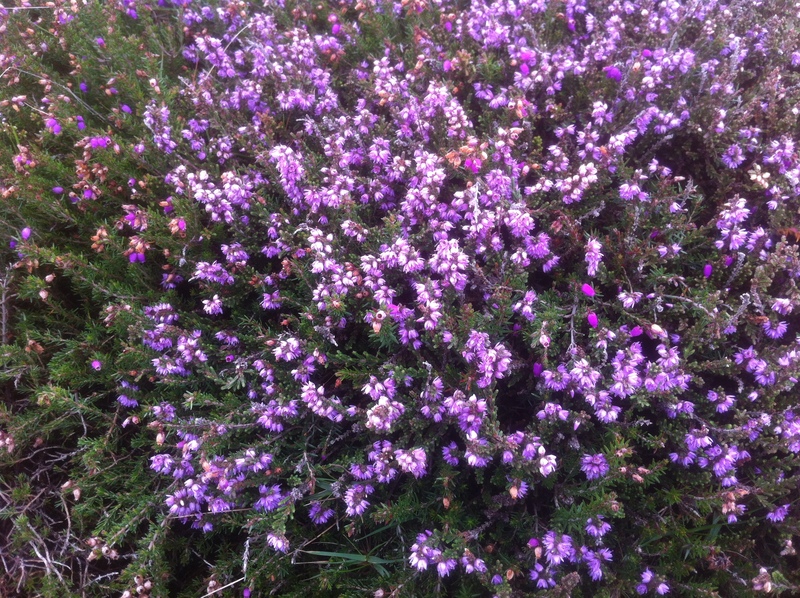 The details Heathland is an important landscape in Jersey, and sadly in decline. This task will involve the clearing of bracken, bramble and invasive trees to uncover the precious heathland plants, such as heather, that are just about hanging on underneath. The site The site we will be working on is called Le Côtil Qui Fut Á Charles Yves Countance, which is the landward side of Les Nouvelles Charrieres, Bonne Nuit, St John. See Google Maps here or if you are using the Jersey telephone directory its on page 24 (D2). Parking Parking is limited in the area, so we suggest that where possible, people car share, or come on bicycles or even walk. We will be meeting at the bus stop at the bottom of the hill, overlooking the harbour. 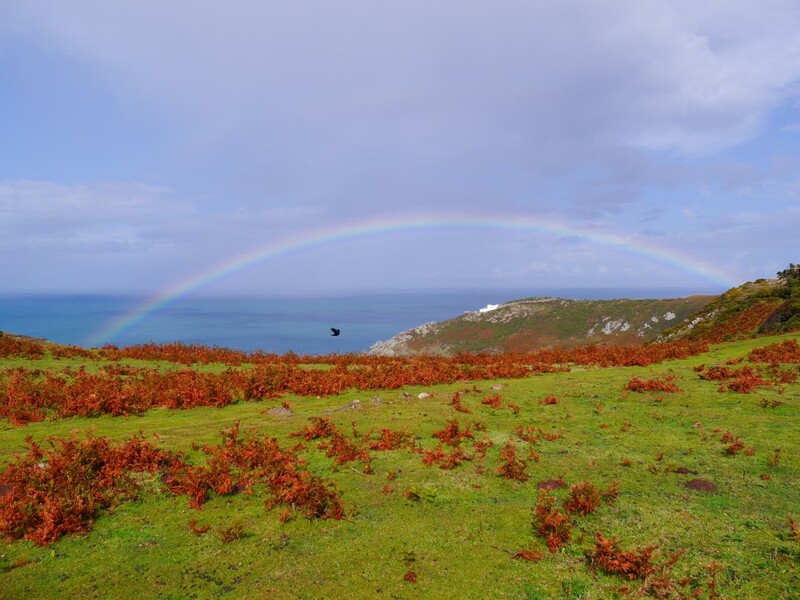 There will be a bright green National Trust for Jersey pick-up parked in it, you’ll not miss it! The task Clearing bracken, bramble and invasive trees. Tools needed If you have any rakes, sickles and forks, please bring them with you, and we do have some gloves, but it’s wise to bring your own if you have them. Clothing needed Appropriate clothing including sturdy footwear and long trousers is recommended due to the terrain and vegetation in some areas. Be prepared for any weather conditions as we will go ahead regardless! Waterproofs, thermals or sun screen (unlikely we know) may all be useful. Finally, and some would say most importantly, the wonderful Kim the Kake will supply us with hot drinks and her yummy homemade cakes. 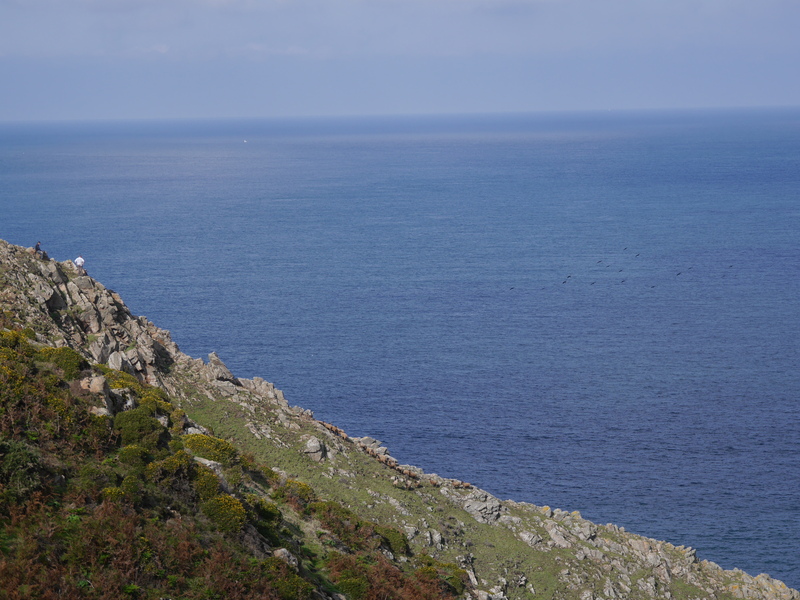 At the start of September the eight captive-reared chicks were released into Jersey. After their thirty-day quarantine and pre-release training they were finally ready to join the rest of the flock. As with the previous chicks released into Jersey we have named them alphabetically with a nod to their new home. We have four males and four females to introduce to the group. Kevin, named after Ronez’s site foreman who looked after Dusty in the quarry, Lee (Durrell), and (St) Mary are the eldest of the group, albeit only by a week or two. Noir, Ormer, and Pyrrho are three girls from the same clutch, and Q and Ronez are the youngest brothers. Each bird has its own colour ring and a radio transmitter attached to their tail feathers so we can monitor them closely after release. 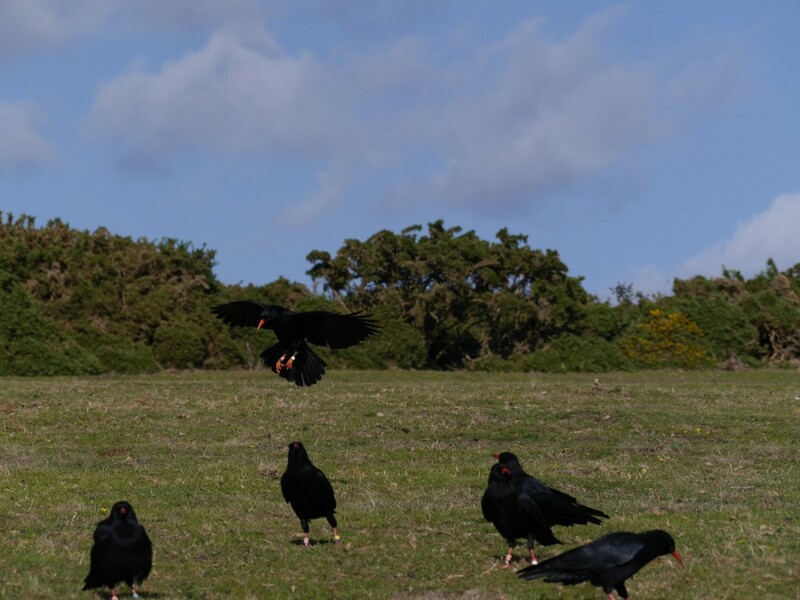 The method for this release had to be tweaked to account for the fact we had almost twice as many choughs living outside of the aviary. Attempting to call back and lock-in eight specific individuals from a group of twenty-three each night would be a practical nightmare (and most likely cause nervous breakdowns amongst staff). This time we simply let them out on the first night then planned to follow them like hawks, so to speak, and call them back for food as and when. 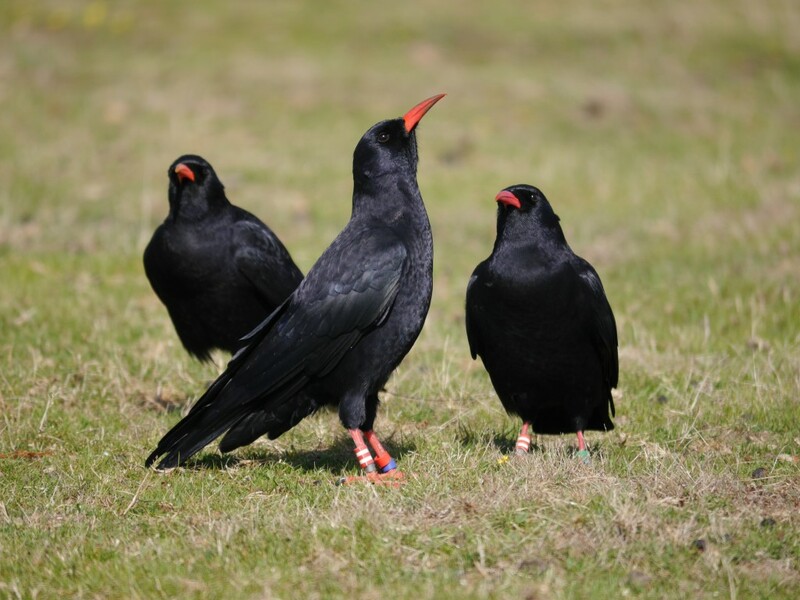 We relied on the social intelligence of the choughs knowing that the outside group would act as mentors and, hopefully, ‘anchor’ the new birds to the aviary site. The hatches opened on the 7th and, in what now appears to be modus operandi for chick releases, the eight birds stayed firmly in the aviary. Eventually when the outside group were called down for food at the aviary, the newbies flew out to meet them, eat, and cause general pandemonium once they realised they were no longer confined to the aviary. 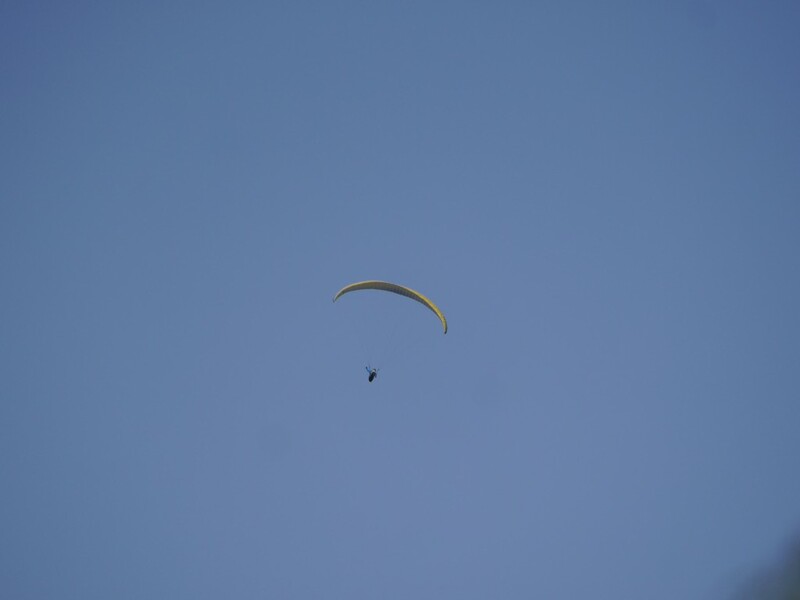 They also had several distractions to contend with in the form of low-flying light aircraft, a helicopter, and paragliders. Definitely a good day for flying then! 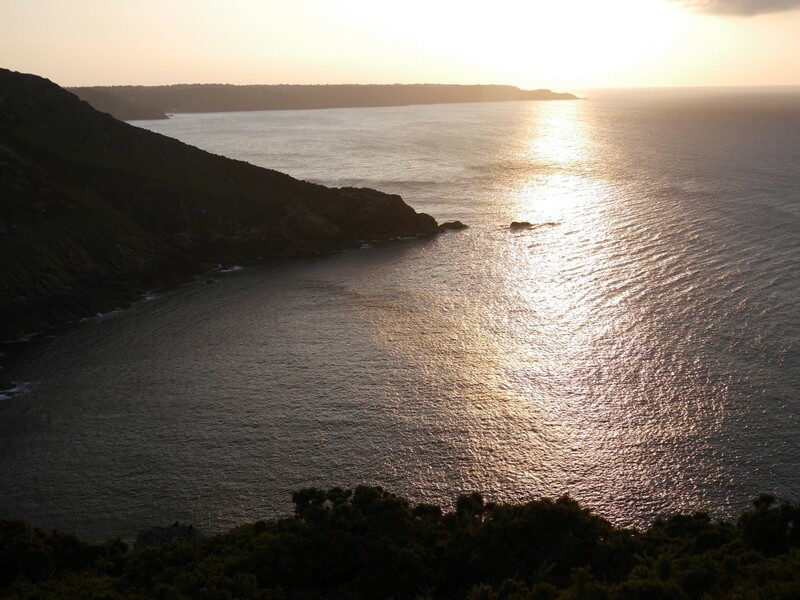 Over the course of the evening the newbies explored the sky above Sorel and the cliff tops. All bar Mary and Q who decided for personal reasons that observing from inside the aviary was a far better option. The other six carried on flying around past sunset clearly trying to decide on a suitable roosting spot on the cliffs instead of the aviary. The next morning they were still out along the cliffs, very rarely going inland. Q had decided to leave the aviary but got ‘lost’ in doing so. 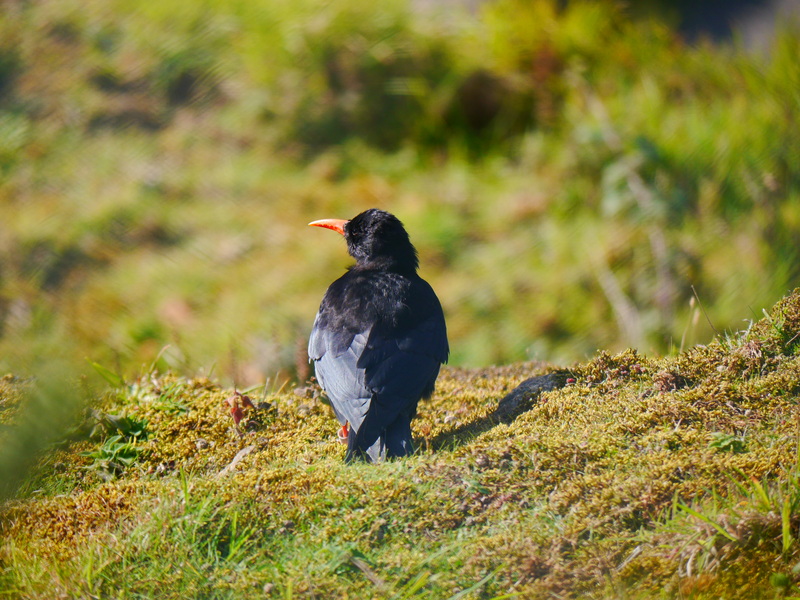 He was probing one of the farmers’ fields at Sorel by himself, calling loudly and not getting any response from the other choughs. Even Mary, 200m away in the aviary was ignoring him or maybe petrified into silence now she was the last bird remaining in the aviary. 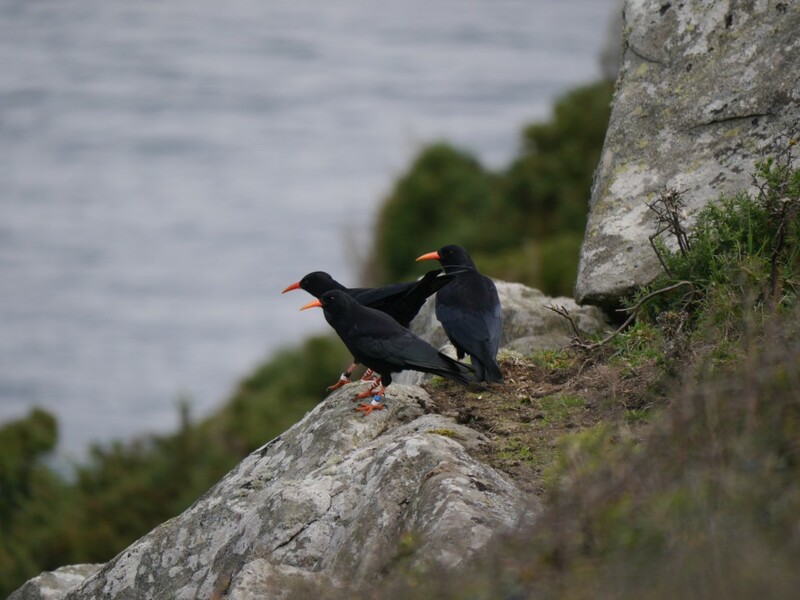 Mary made her way out by midday and joined Q, who had now joined the adult flock, and suddenly 23 choughs were swirling around the cliff tops. The newbies still avoided the aviary even at feed times. 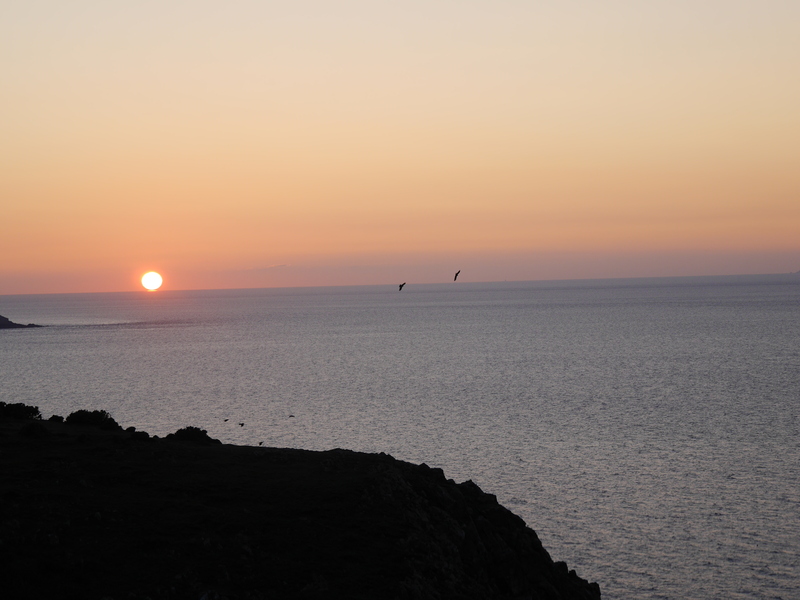 On the second night they moved towards Sorel Point to find a better roost spot. 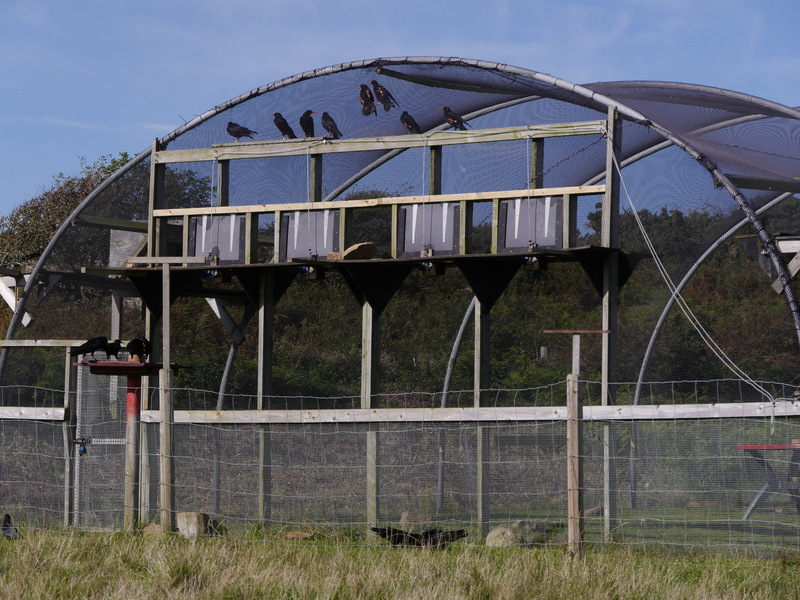 Over the course of the next five days the newbies kept using this roost site, but one-by-one they returned during the day to join the others at the aviary. All except Q and Ronez who for reasons known only to themselves decided the quarry looked a much better place to hangout in. 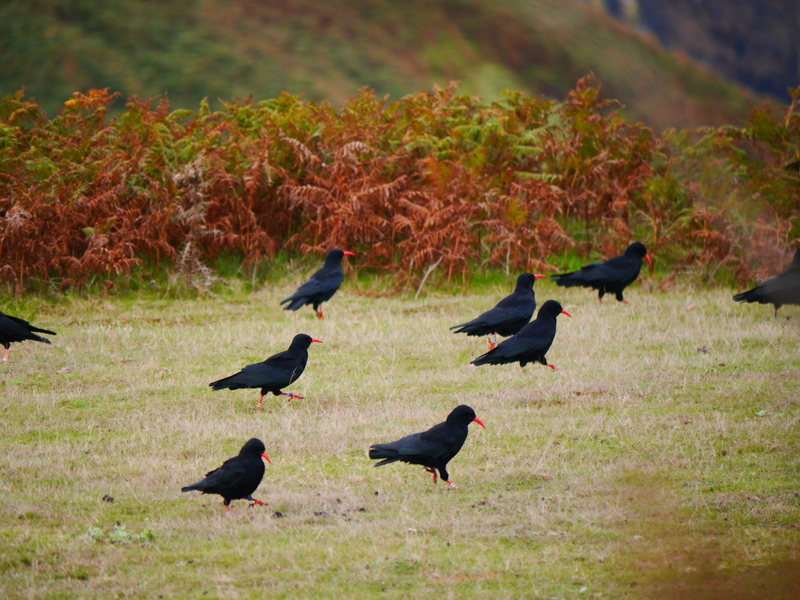 They didn’t, however, hangout with the other choughs who use the quarry. Instead they went to the rock-face in the south-east corner and stayed there. We managed to catapult food onto the quarry ledges. We had to battle with the wind. Sometimes it was calm but at other times you were fighting with the wind to merely stay upright. 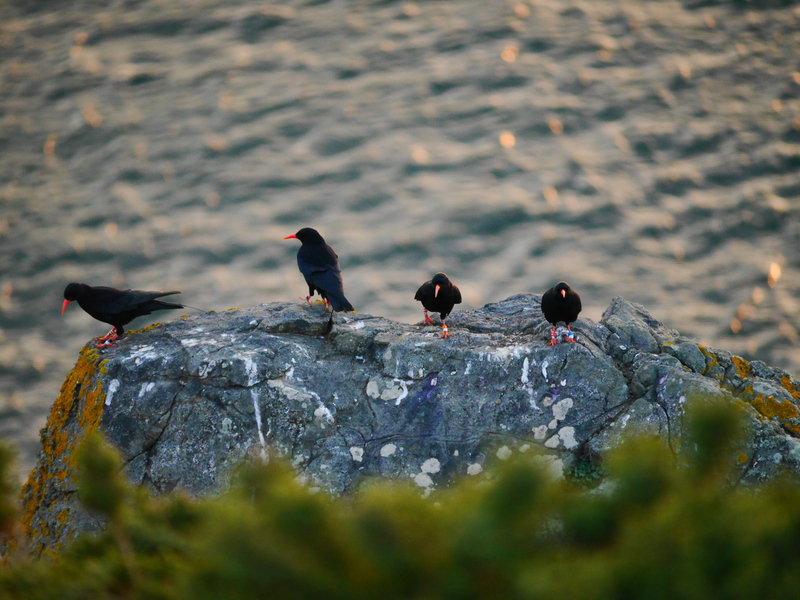 Sadly for the youngest chough, Ronez, our efforts, and his, to stay alive on the ledges did not pay off. On the evening of the 13th both he and Q were left probing away near the fenceline at the Ronez loop road. 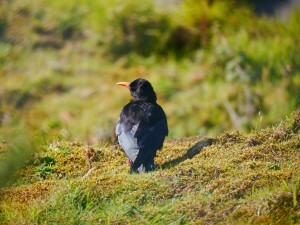 The next morning there was only one chough visible. Ronez’s radio signal was loud and clear suggesting he was close by and not moving. 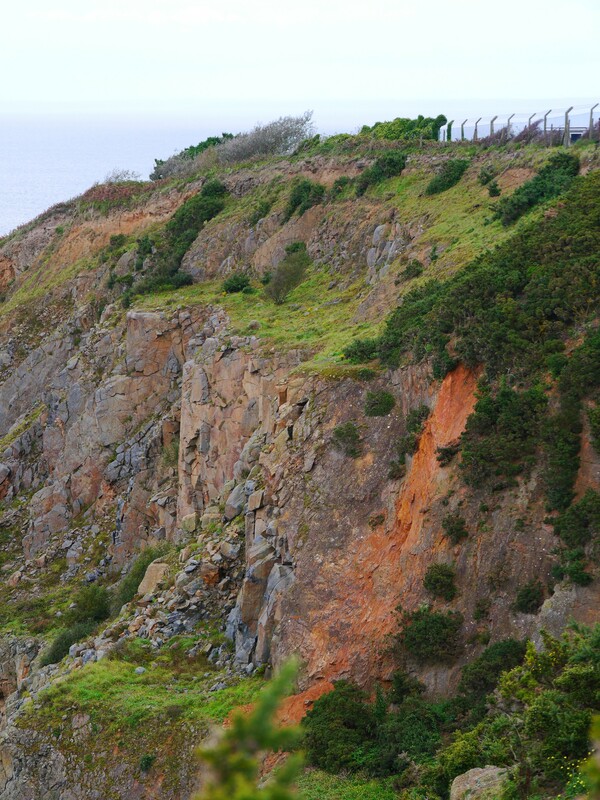 The unstable nature of the rock face prevents access to the site. He may well have been predated if he roosted on the ground. 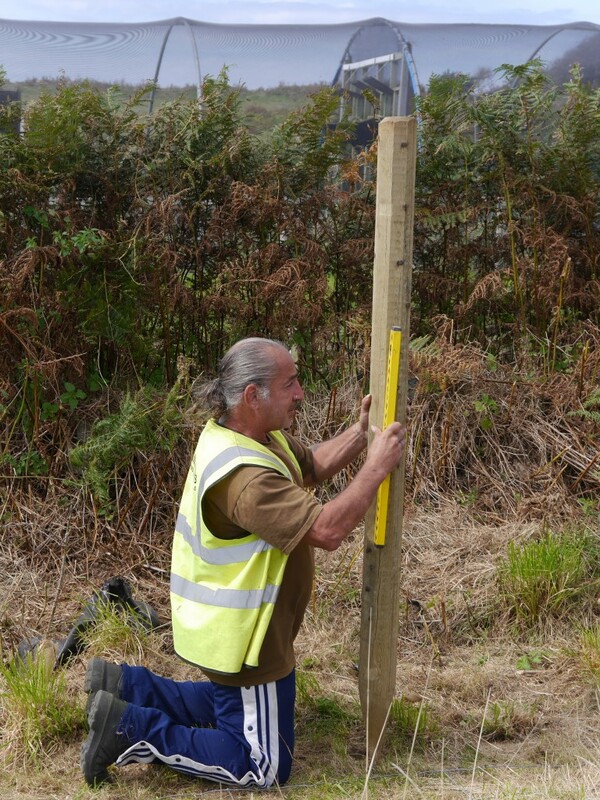 Feral ferrets have been seen by quarry staff and this particular area is very accessible to a predator who takes little heed about Health and Safety regulations. Just as likely he could have become weak without means of getting out and starved. Either way there was nothing we could do further and it is, sadly, part of the course. 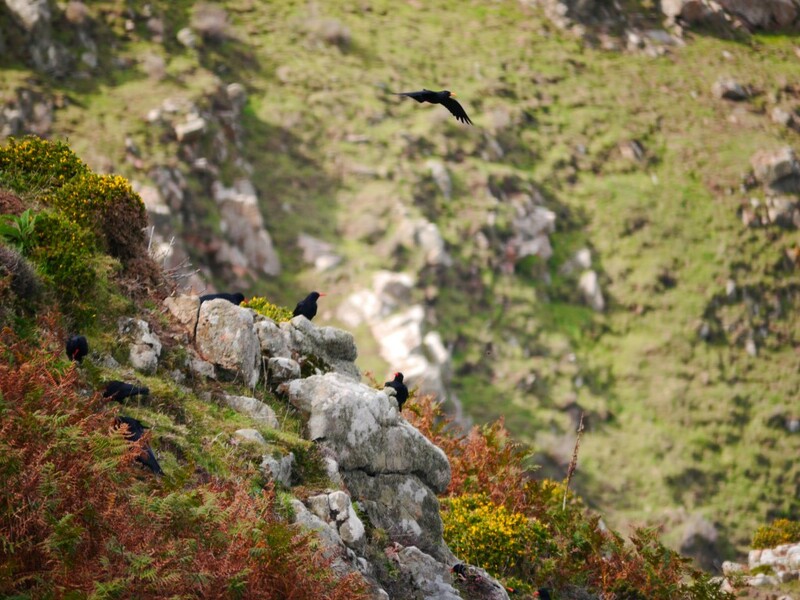 Q left the quarry shortly after that and rejoined the other choughs. 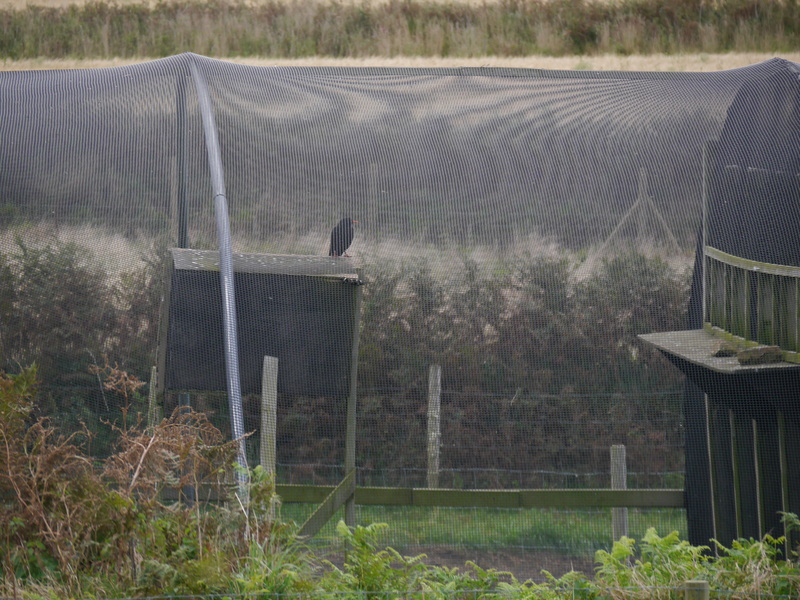 They now roost in the aviary and return for food provided by staff. They are very good at probing for insects as well and have been spending their mornings at Devil’s Hole on the other side of the valley to Sorel. 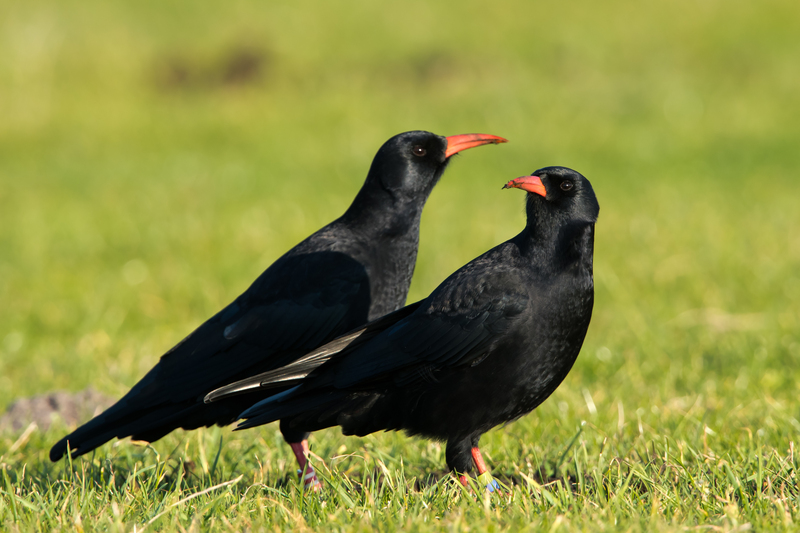 We have even had a report of a group of eight birds at Les Landes Racecourse. We know from photographs that two of the eight were juveniles from 2014. 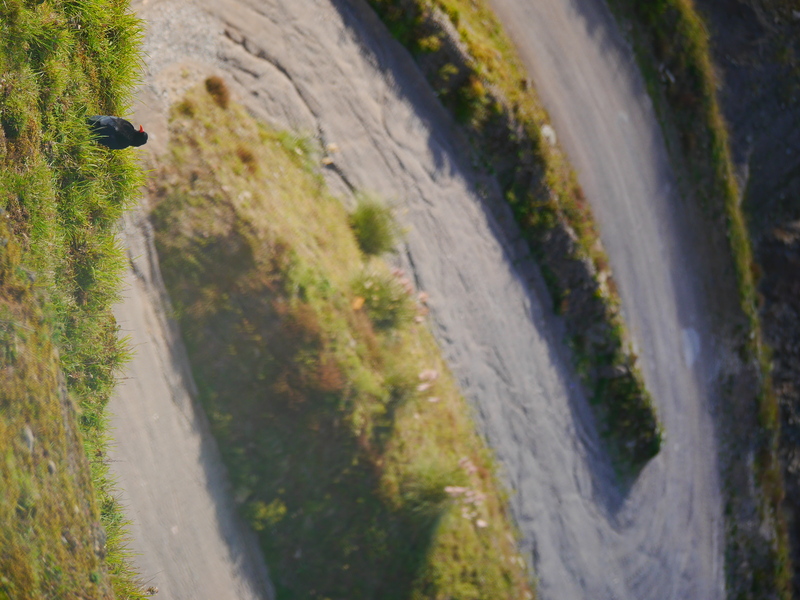 These birds flew to Les Landes last October to explore but didn’t spend much time there. It will be interesting to see where they decide to go this year. 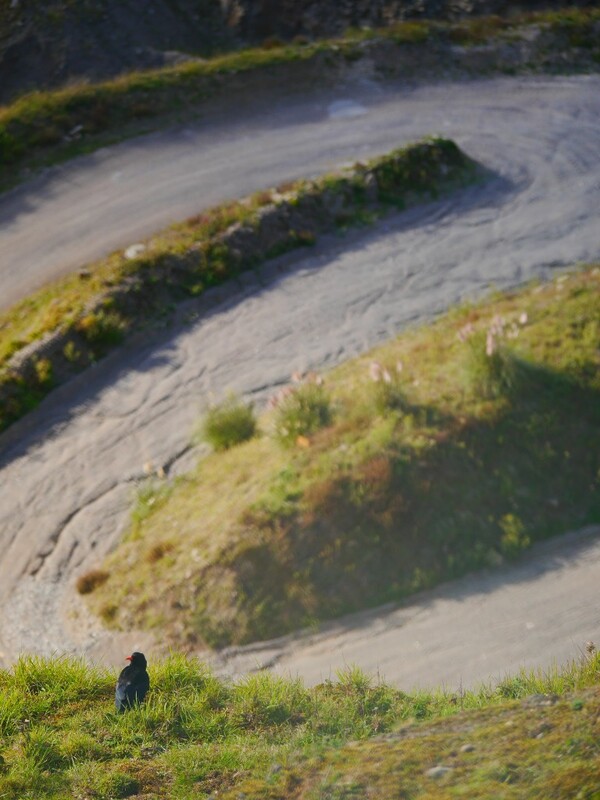 We can only follow the young, newly released and naïve, choughs as they discover their new surroundings and learn to survive in the wild because they have tail-mounted radio transmitters. Each of these transmitters has to be bought and, unfortunately, doesn’t have a very long life. If the birds don’t lose their transmitter the battery will run out. We are lucky to ever find the old transmitters and anyway we are only able to change the battery once before the transmitter can not be further modified. So, we need a lot of transmitters, and this is a big area of our annual budget and this year we are extremely grateful to Action for Wildlife Jersey for funding our 2015 transmitter needs. In fact, the funds so generously provided, also allowed us to buy a new electronic balance to weigh the birds up at Sorel and check on their health. 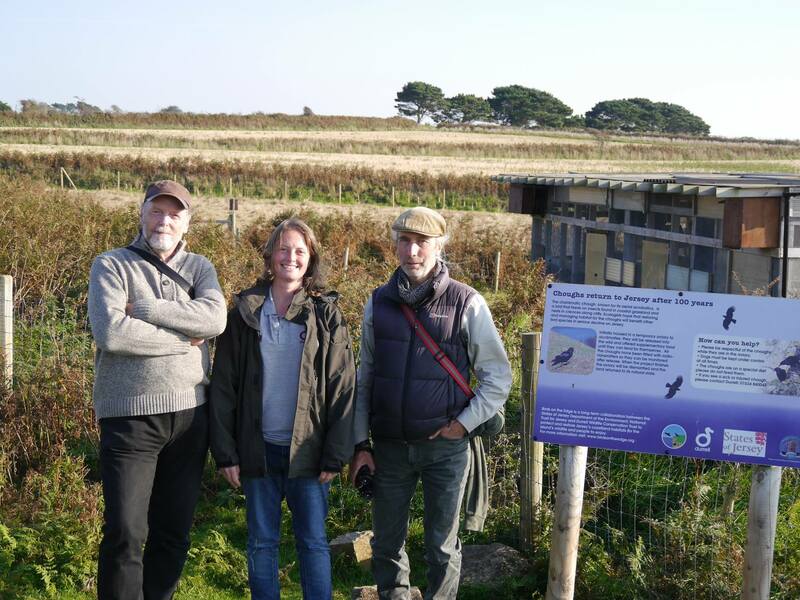 On 30th September we were proud to introduce leading author and journalist Simon Barnes to the chough flock. Simon, author of such notable books as How To Be A Bad Birdwatcher and Birdwatching with Your Eyes Closed (see the full list of Simon’s books here) was in Jersey for the 2015 Jersey Festival of Words and took time out to see the Sorel birds and hear about Birds On The Edge and the work being done to restore our habitats and give local birds a chance to survive. In order to comply with its environmental responsibilities under legally binding agreements, the Department of the Environment last year carried out a survey of small mammal species on the Island to understand changes or threats to populations and to protect them from further loss. The Department last carried out a similar survey 16 years ago and wanted to find out what changes have occurred since then. 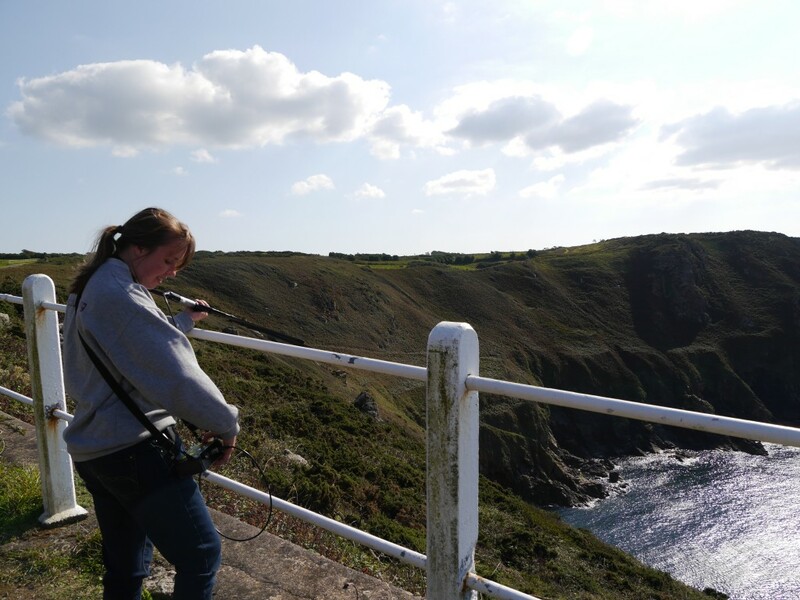 In 2014 the Department commissioned Natural Solutions Ltd. to carry out a survey of small mammals in Jersey and to prepare a detailed assessment of the changes that have occurred in population densities since an initial survey carried out in 1998. The results of the latest survey, compiled by Denise McGowan and Professor John Gurnell, were published recently. 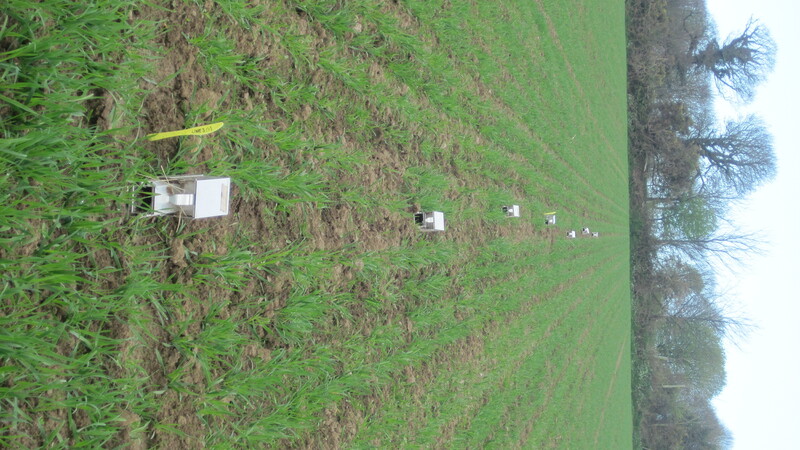 This new report looks at population numbers, densities and biomass over different seasons and habitats, with the aim of finding out more about the changes that have occurred over the 16 year period. 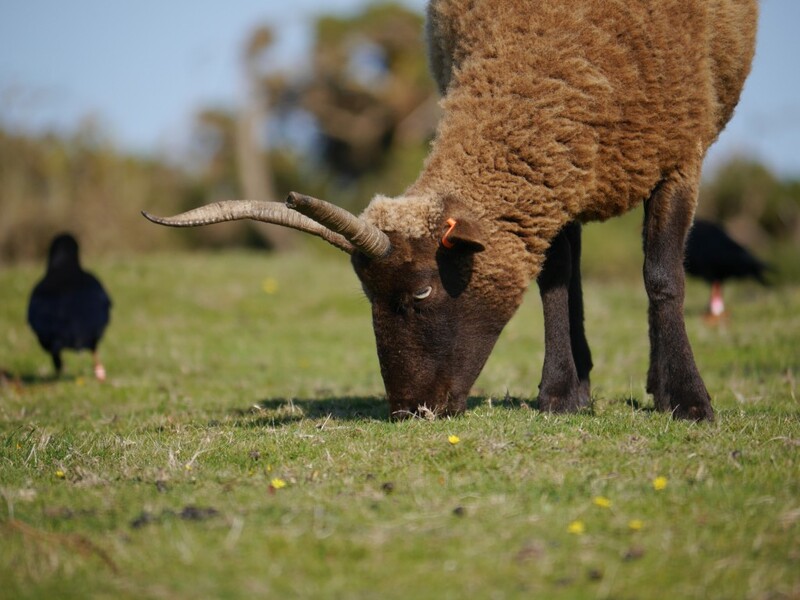 Small mammals matter because they play a vital role in maintaining a balanced ecosystem in Jersey, as keystone prey species for our large predators including birds of prey and snakes. They are indicators of habitat quality and help shape our environment. 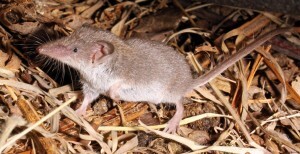 The vole is a unique Jersey sub-species and, in the British Isles, the lesser white-toothed shrew is only found in Jersey, Sark and the Isles of Scilly and Millet’s (or French) shrew only in Jersey. 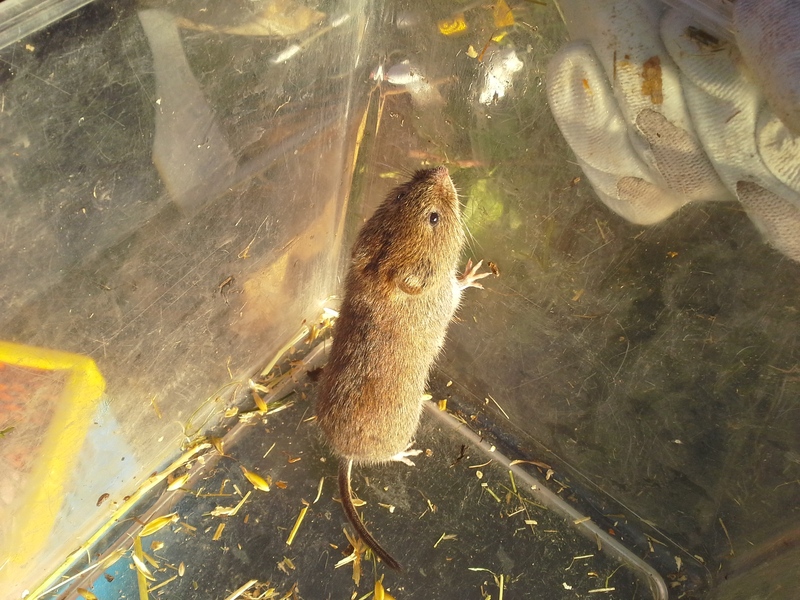 The vole and the two shrew species are protected under the Conservation of Wildlife (Jersey) Law 2000 and Jersey is committed through its legislation and international conventions to monitor and protect them. Results indicate that since 1998, wood mice have continued to be widespread; the Jersey bank vole has followed a similar pattern but appeared to favour heathlands, hedgerows, woodlands and undisturbed grasslands. 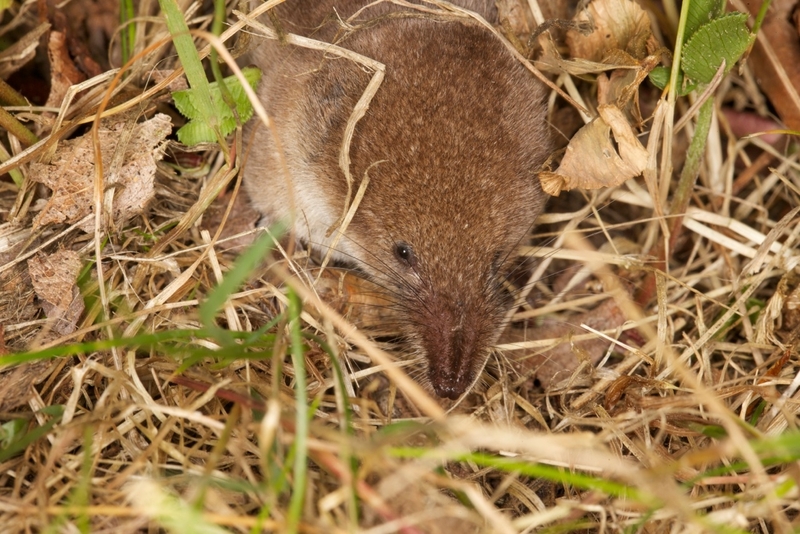 The data for shrew species was more difficult to compare across the two surveys due to a low capture rate and a patchy distribution across sites, seasons and years. Further work is required to determine what could be affecting the shrews’ distribution and population numbers in Jersey. New research by the British Trust for Ornithology (BTO) has revealed that bird food provided in our gardens has helped blackcaps to rapidly evolve a successful new migration route. This is the first time that garden bird feeding has been shown to affect large-scale bird distributions. 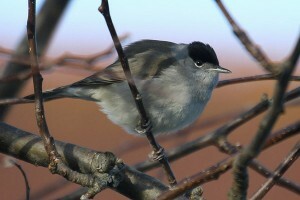 Historically, the migratory blackcap was only a breeding summer visitor to the British Isles. However, over the last 60 years there have been surprising changes in the species’ migration behaviour, with birds from central Europe visiting our gardens in winter, rather than heading to their usual wintering grounds in southern Spain. The reasons why the British Isles have become great for blackcaps were previously unclear, but now scientists have been able to uncover some answers, using the extensive data on garden birds and feeders collected by thousands of volunteer birdwatchers for the BTO’s weekly Garden BirdWatch survey. 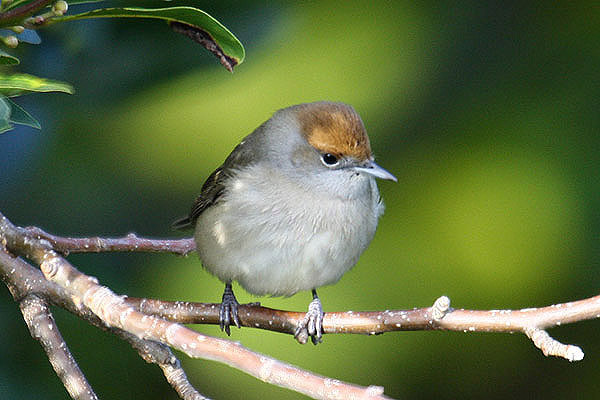 The new study, published in the international journal Global Change Biology, has revealed that blackcaps are becoming increasingly associated with garden bird feeding over time, and that supplementary foods, particularly fats and sunflower hearts, are affecting their national distribution in winter. 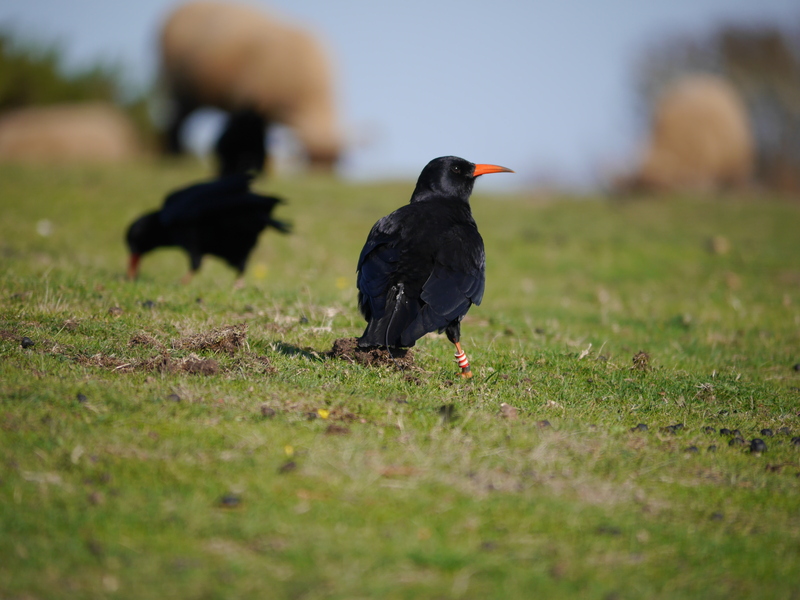 The findings also indicate that changes in the British winter climate have been important in shaping the evolution of this new migration behaviour. Dr Kate Plummer, BTO Research Ecologist and lead author of the paper, said: “This is the first scientific evidence that supplementary foods provided in gardens can influence the evolution of wild birds, so the findings are extremely important. 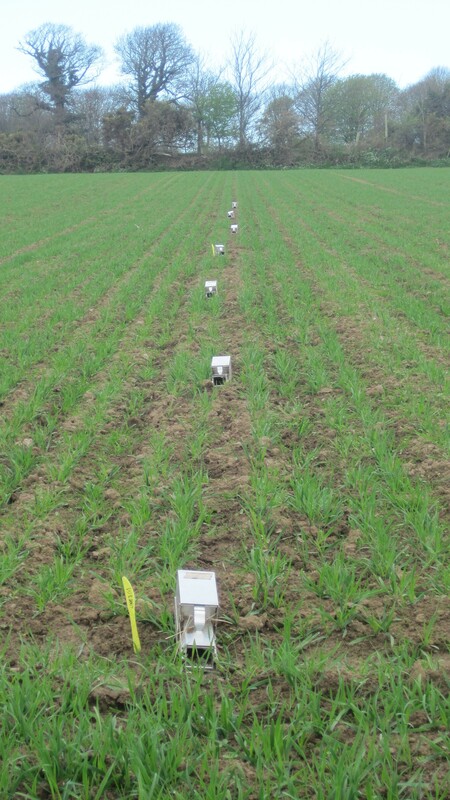 As the global environment rapidly changes due to human activities, it is becoming increasingly important that we understand if, and how, species are able to respond. These findings indicate that some species, like blackcap, may be more resilient to environmental change than we previously assumed. The research is set to continue with an investigation into how garden bird feeding has affected goldfinch numbers, and over the winter the BTO will be calling for observations from people who feed goldfinches in their gardens. 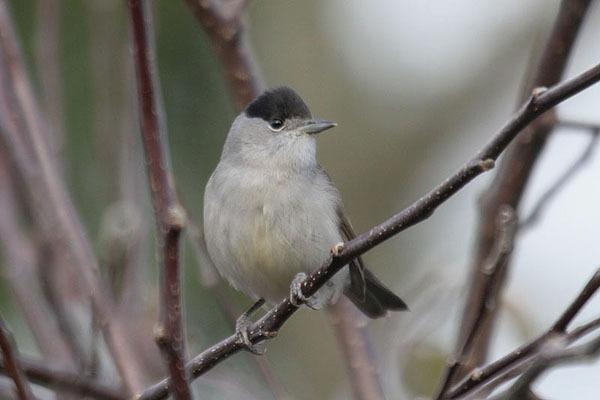 In Jersey, our own Garden Bird Watch results have shown increasing numbers of blackcaps in the Island’s gardens. 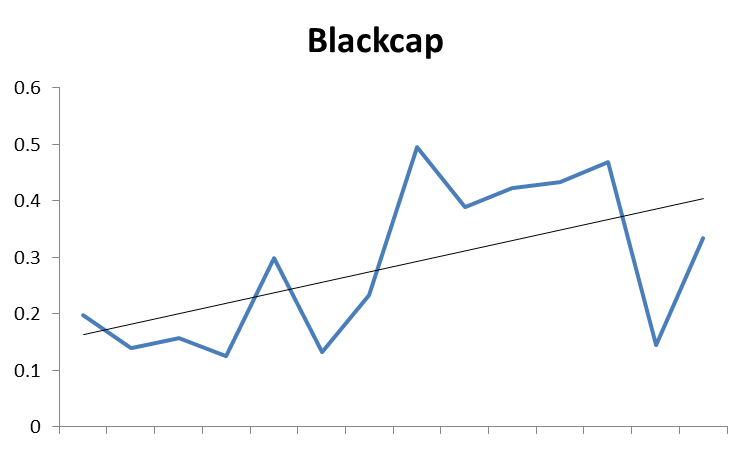 Interestingly, and supporting the new study, our own monitoring shows that the blackcaps that spend the spring and summer in our woodlands all but disappear over winter while they are easy to find in gardens over this period. They say the grass is always greener on the other side. 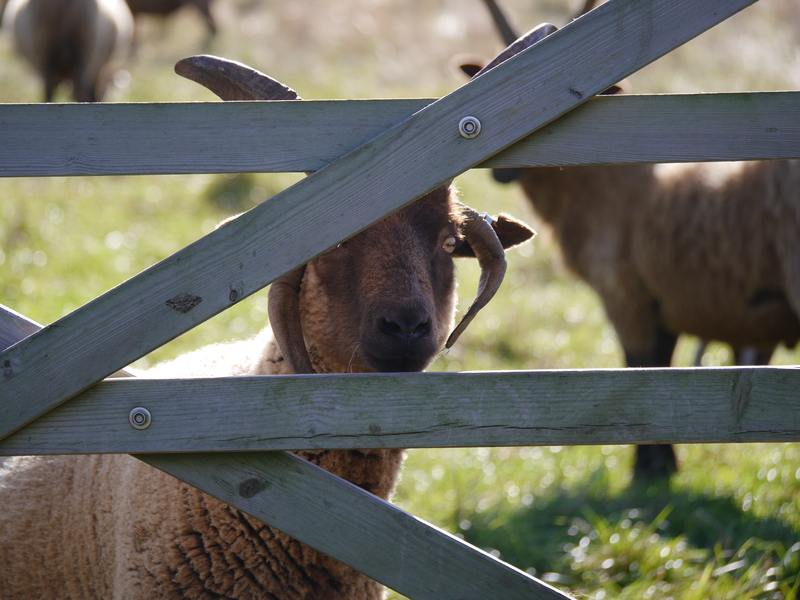 Well now the sheep at Sorel can find out first-hand. Thanks to the skill and hard work of the guys on the Back to Work scheme and Ecoscape, the sheep now have access to extra grazing land at Sorel. 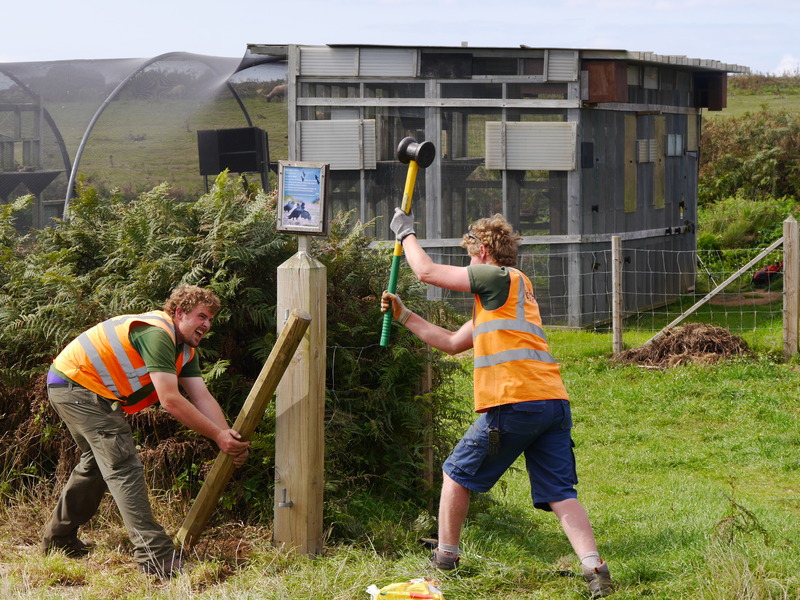 A fence has been erected around the field adjacent to the chough release-aviary allowing for the shepherd to improve the management of his flock. It is a relatively small area, but it will make a huge difference. 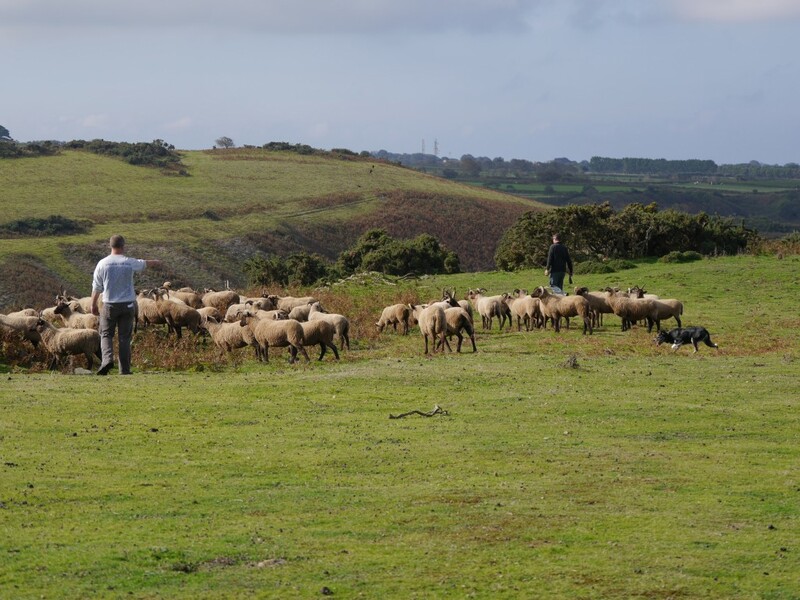 Once the fence was up and tools cleared away, the shepherds then had the seemingly mammoth task of herding the sheep from the cliffs and picking out which sheep would go in the new site. Luckily for them Mist the sheep dog, made the job a lot easier. The shepherding team showing off their skills. Photo by Liz Corry. 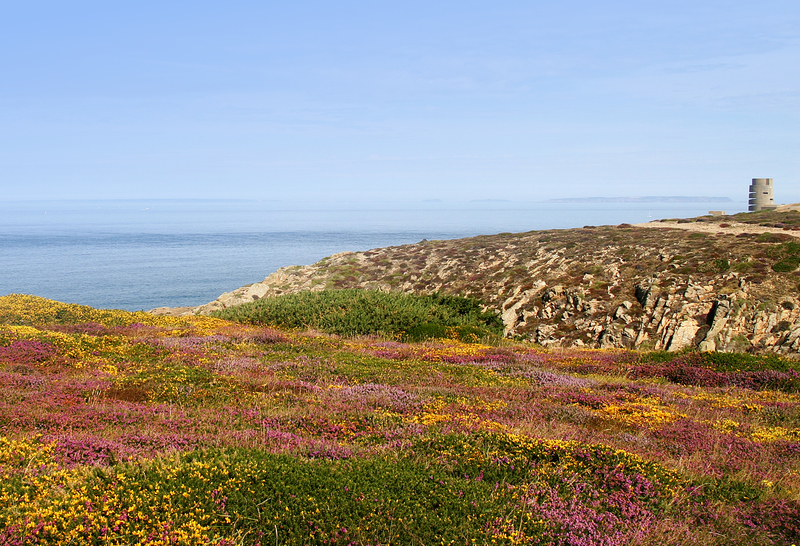 Up until the beginning of the 20th Century, the coastal headlands were an important part of the rural economy. Cattle, ponies and sheep would have grazed upon these areas and gorse and bracken would have been collected for fuel and bedding respectively. 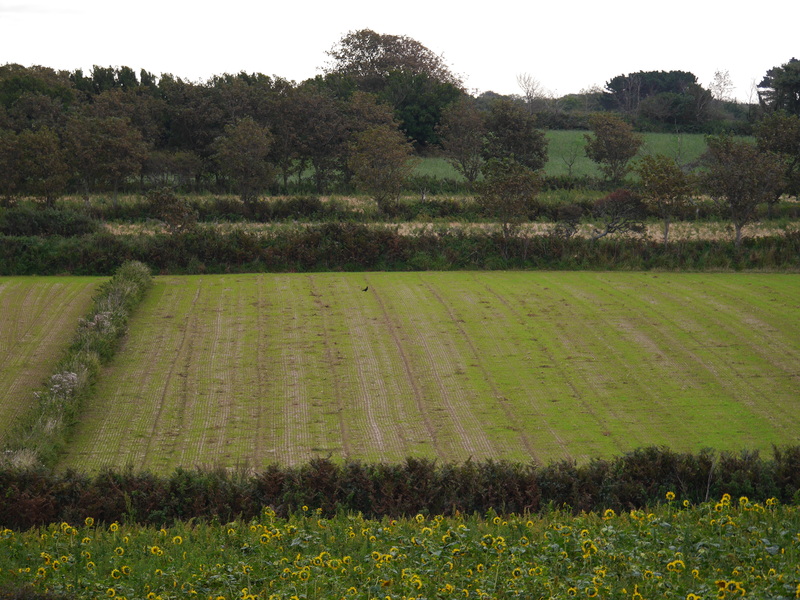 The disappearance of such practices allowed bracken and scrub to encroach, in turn leading to the disappearance of many coastal and heathland species. 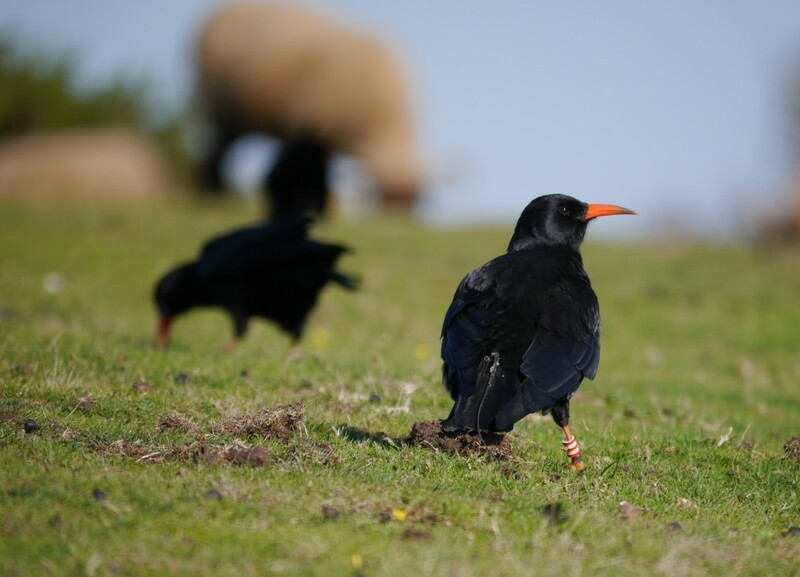 The red-billed chough is a prime example of such a species relying on the sheep to improve habitat as well as providing their wool for nest building. 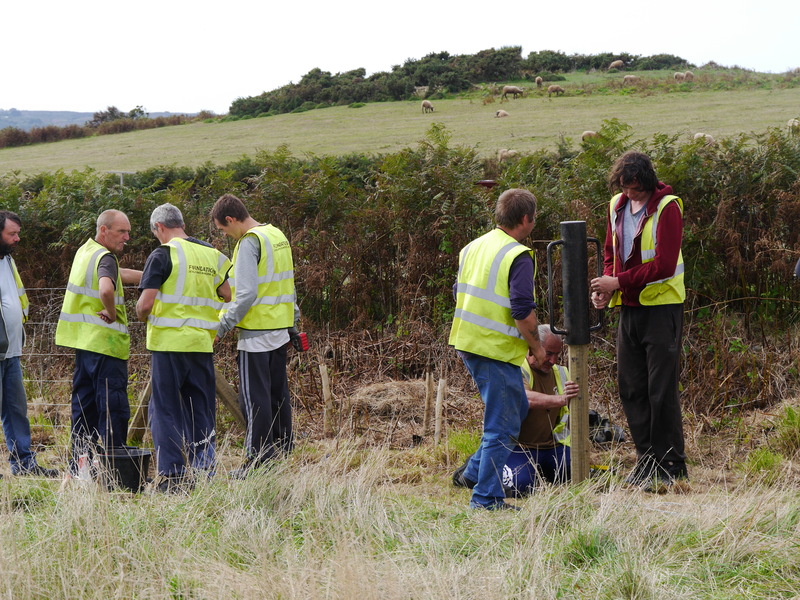 The Back to Work scheme, set up by the Social Security Department and Department of the Environment, helps unemployed people in Jersey to gain skills and experience to attain permanent employment while carrying out dedicated projects enhancing Jersey’s biodiversity. 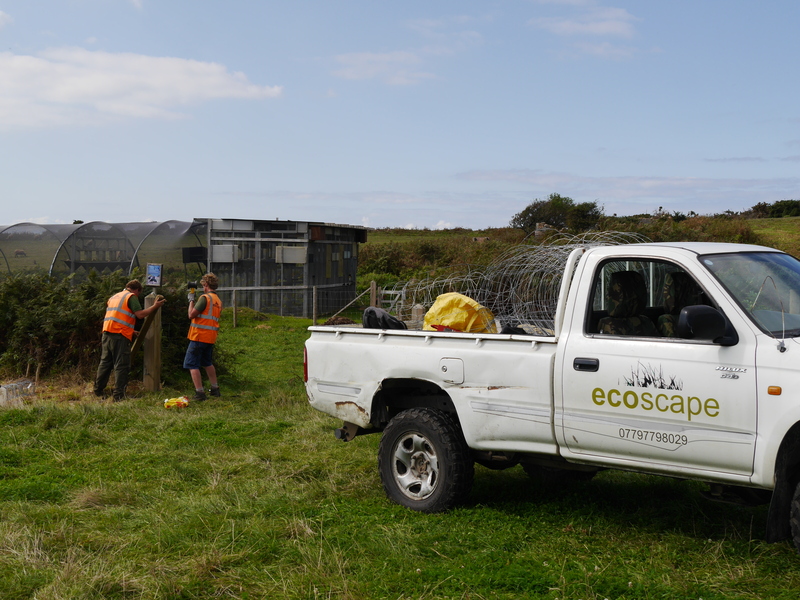 Ecoscape, a local contractor with a wealth of environmental experience, provide guidance and training to participants on the scheme. Its hard work at times, but the skills acquired and sense of achievement with the end result can be very rewarding. A video produced by ALC gives you an insight into what was involved over the five days the team worked at Sorel. You can also view it via Ecoscape’s Facebook page.